Zimbabwean police have detained senior opposition politician Tendai Biti in the capital following his deportation from Zambia, his lawyers have said. Zambia’s government rejected Mr Biti’s request for asylum on Wednesday. He fled to Zambia after Zimbabwean police issued an arrest warrant for him, accusing him of inciting violence. Zimbabwe’s opposition MDC Alliance has rejected President Emmerson Mnangagwa’s victory in last week’s elections, saying the result was rigged. 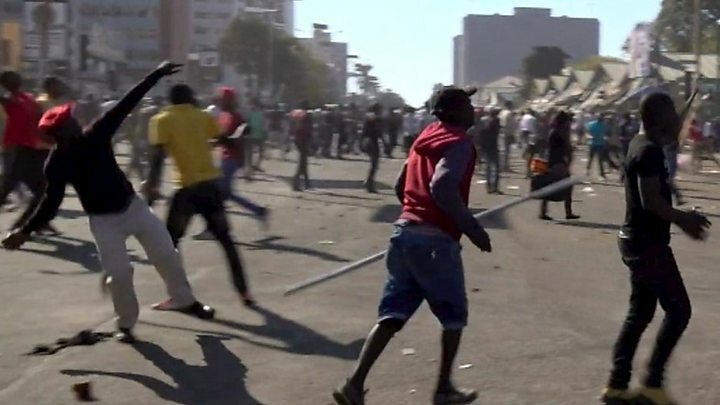 At least six people were killed two days after the vote in clashes between security forces and MDC Alliance supporters demanding that their leader, Nelson Chamisa, be declared the winner. There was great optimism that the elections would bring real change after the end of Robert Mugabe’s 37-year rule last November. But the MDC Alliance says the security forces have launched a brutal crackdown on the opposition following the disputed poll. The government says the opposition is threatening stability, and efforts to rebuild Zimbabwe’s shattered economy. Mr Biti’s arrest warrant, seen by the BBC, says he “unlawfully” announced that Mr Chamisa had won the election. 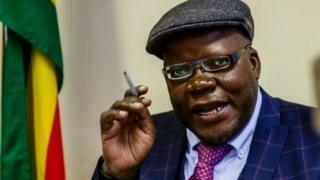 His lawyer Gilbert Phiri said Zambia’s High Court ruled on Wednesday night that Mr Biti should not be deported until a “judicial review” of the government’s decision to reject his asylum application. However, Zambian immigration and police officers refused to accept the court papers, and surrendered him to Zimbabwean law enforcement officers at the Chirundu border post, about 350km (220 miles) north of Zimbabwe’s capital, Harare, Mr Phiri said. The Zambian government has probably taken its revenge on Mr Biti by deporting him to Zimbabwe. Mr Biti came to Zambia last year to show solidarity with opposition leader Hakaide Hichilema after he was arrested on treason charges. He was scathing in his criticism of Zambia’s President Edgar Lungu, accusing him of behaving like then-President Mugabe by targeting Mr Hichilema. So, it is not surprising that Zambia has deported him. Zambia’s ruling Patriotic Front (PF) party has always been a staunch ally of Zanu-PF, which has been in power since Zimbabwe’s independence in 1980. Its founding leader, the late Michael Sata, was inspired by Mr Mugabe, and like him regarded the MDC as a “puppet of the West”. When Mr Sata formed the party in 2001, he named it PF to signal that it would forge close ties with Zanu-PF. The relationship remains strong some 17 years later, albeit with new leaders at the helm of the two parties. “They [Zambian officials] quickly opened the border at around 06:00 [04:00 GMT] and took loads of paramilitary officers there,” Mr Phiri said. “After sometime, we just saw a convoy exiting on the Zimbabwean side and Biti was immediately not reachable on phone. That’s how he has gone,” he added. The Zimbabwe Lawyers for Human Rights group said they had tracked down Mr Biti, and he was being held at the Harare Central Police Station. He is the most senior opposition leader to be detained since Mr Mnangagwa took office. On Wednesday, Zambia’s Foreign Minister Joe Malanji told the BBC that Mr Biti’s grounds for asylum were weak. Altogether the police are hunting for nine senior opposition officials in connection with post-election violence. The MDC Alliance has confirmed that it will challenge the presidential election result in court, saying it was marred by “mammoth theft and fraud”. The electoral commission says there was “absolutely no skulduggery”. Mr Mnangagwa obtained 50.8% of the vote, compared with Mr Chamisa’s 44.3%. The remaining votes went to 21 other candidates. In the parliamentary election, Mr Mnangagwa’s Zanu-PF obtained 144 seats; the MDC Alliance, which is made up of seven parties, 64 seats, and one seat to the National Patriotic Front, formed by Mugabe loyalists. Although Zanu-PF won by a landslide, its majority has shrunk since the 2013 election when it obtained 160 seats and the MDC 49. Mr Biti was the minister of finance in a unity government formed after disputed elections in 2008 – and is credited with helping stabilise the economy after years of hyperinflation.